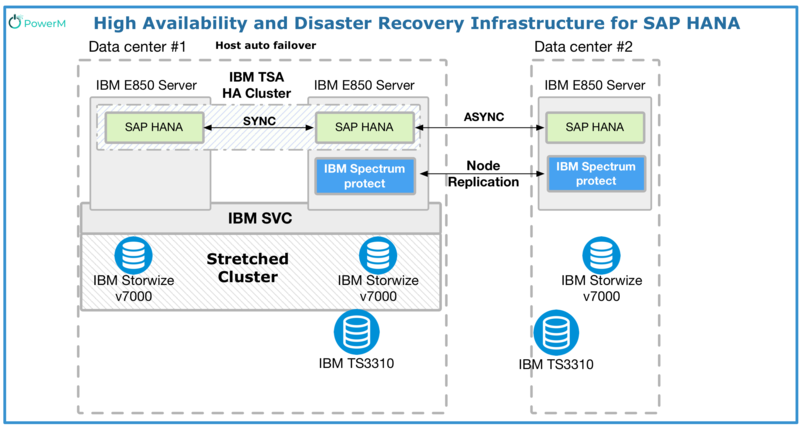 Running SAP HANA on IBM Systems offers customers a consistent platform for their HANA- based and traditional applications, best-in-class performance, resilience for critical workloads, and most flexible infrastructure. Existing IT assets – servers, storage, as well as skills and operation procedures – can easily be (re-)used leveraging the SAP HANA Tailored Data Center (TDI) concept, instead of enforcing additional investment into dedicated SAP HANA only appliances. 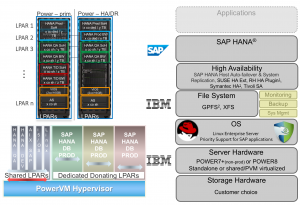 SAP HANA systems can be deployed exploiting PowerVM capabilities. This can lower the entry barrier for SAP HANA significantly, since test systems can be easily installed on a partition using available resources or Capacity Upgrade on Demand (CoD) capacity – there is no need to purchase dedicated hardware for SAP HANA on POWER. From a technology perspective, IBM Power Systems are very well suited to provide excellent SAP HANA database performance and reliability. The port of the SAP HANA code to POWER architecture benefits from excellent memory bandwidth, SIMD parallelization, and Simultaneous Multi-Threading (SMT) on POWER. System Automation for Multiplatforms provides a high availability environment, in which systems are continuously available. The self-healing infrastructure provided by the product prevents downtime that is caused by system problems. The recovery infrastructure detects improper operations of systems, transactions, and processes, and initiates corrective actions without disrupting users. With System Automation for Multiplatforms you can configure high availability systems by creating and working with automation policies. The automation policies define the relationships between the various system components. 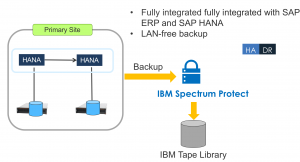 IBM Spectrum Protect for Enterprise Resource Planning protects your vital SAP system data. It provides automated data protection designed for SAP and SAP HANA environments. Now you can improve the availability of your SAP database servers and reduce your administration workload. Delivers business value by protecting SAP and SAP HANA data efficiently and consistently. Helps increase productivity by reducing repetitive administrative tasks. Enables SAP certified processes for heterogeneous environments. Provides more efficient backup of very large SAP databases. Integrates with database-specific utilities of IBM DB2® for Linux, UNIX and Windows, Oracle and SAP BR*Tools. To reduce the time for the SAP backup, the online backup can be combined with storage based backup via IBM FlashCopy. This can be achieved with IBM Tivoli Storage FlashCopy Manager (FCM). IBM FlashCopy with IBM FCM delivers high levels of protection for key applications and databases using advanced integrated application snapshot back- up and restore capabilities. It lets you perform and manage frequent, near- instant, non-disruptive, application-aware backups and restores using integrated application. 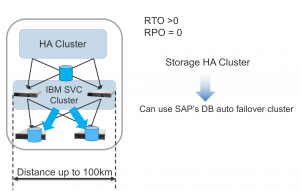 The stretched cluster is an extended High Availability (HA) method supported by SAN Volume Controller to enable I/O operations to continue after the loss of half of the system. This is also sometimes referred to as a split cluster because one half of the cluster and I/O group is usually in a geographically distant location from the other; often 10 kilometers or more. A third site is required to host a controller that provides a quorum disk.